Designs range from coastal cruisers to high concept science vessels. The vast majority of boats rely on fossil fuels that tax the environment. Fortunately, alternative energy is on the rise in the marine world, and solar-powered ships are prepared to sail into a much cleaner future. It's been a few years since the world's largest (at the time) solar-powered ship completed its journey around the world, and a number of a fresh concepts are now awaiting construction. Giant multimillion dollar luxury yachts promise stellar sightseeing adventures with silent, solar-powered engines, while a unique vertical marine vessel will someday serve as a long-term base for deep sea research. Meanwhile, an autonomous solar-powered boat is currently making its way across the Atlantic. Read on to learn about all the wild and crazy solar-powered vessels just waiting to hit the waves. 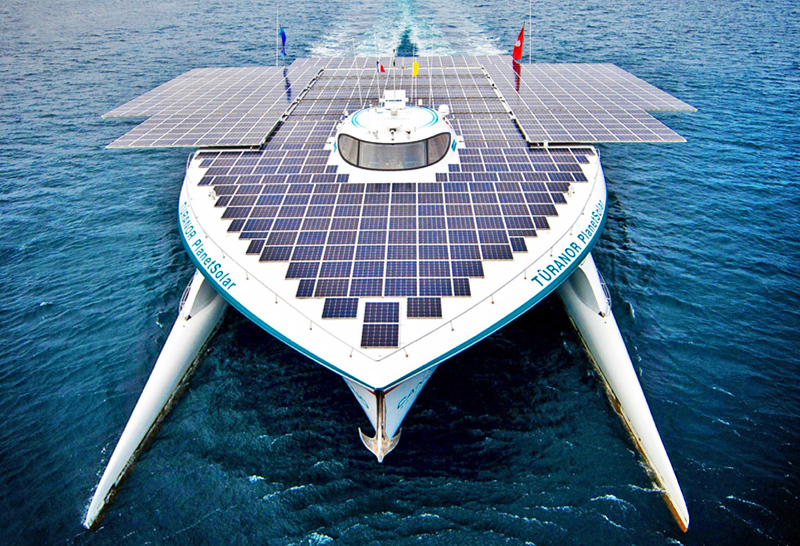 At the end of its successful 18-month trip around the globe in 2012, the Turanor PlanetSolar was the largest solar-powered boat in the world. The $26 million catamaran-style vessel measured 101 feet long and 49 feet wide, with a capacity up to 50 passengers. Some 537 square meters of photovoltaic panels powered the Swiss-designed solar boat during its round-the-world journey. 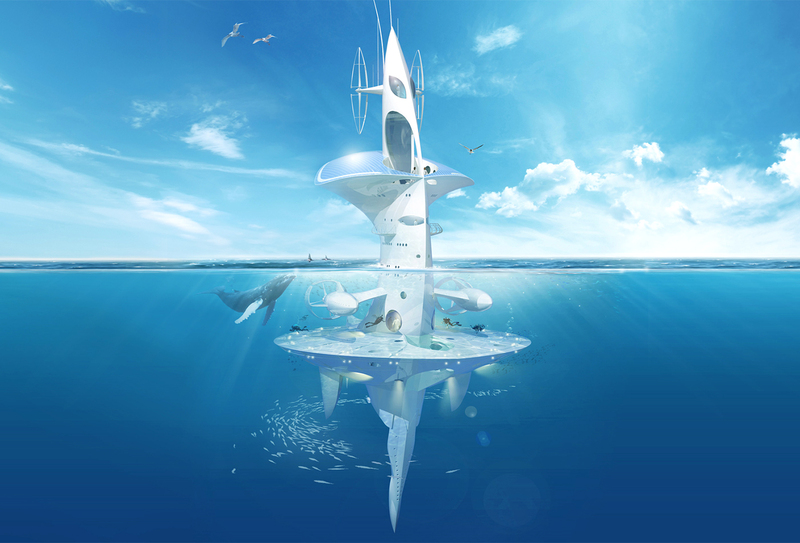 French architect Jacques Rougerie designed the SeaOrbiter, a futuristic vertically oriented marine vessel that offers a round-the-clock undersea station for long-term research and observation. SeaOrbiter has multiple levels of underwater cabins and a wide skirt that offers divers a place to rest while they study oceanic ecosystems. Two years after a successful crowdfunding campaign raised nearly $388,000, the ship still hasn't come to fruition. A key element of the design, the Eye of SeaOrbiter, was finished in May 2015 and will remain on display while project backers organize funding to build the rest of the ship, which will likely cost tens of millions to complete. Although many new solar-powered boats are enormous ships, there are a few exceptions. The Solar Voyager, a small vessel designed and built by Isaac Penny and Christopher Sam Soon, is one of them. 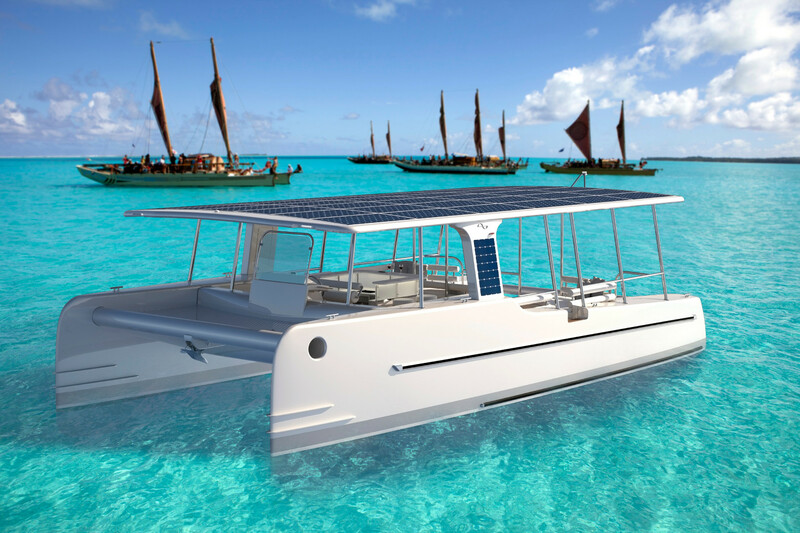 Solar Voyager is a low-slung single-hulled boat with a roof covered edge to edge in solar panels. 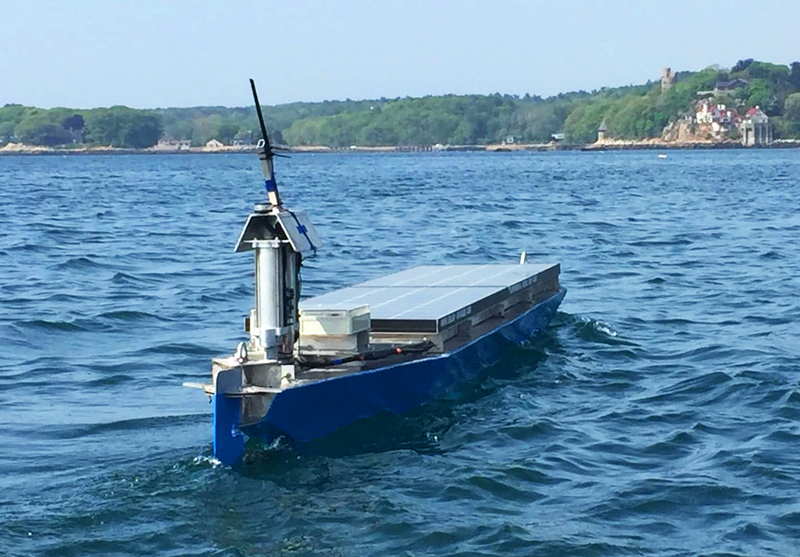 The autonomous marine vessel is currently sailing across the Atlantic Ocean, having disembarked Boston on June 1st, and it's aiming to dock in Portugal some time next month. Penny and Sam Soon monitor the boat's progress through remote updates, received every 15 minutes through the boat's on-board satellite uplink. All they need to do now is find someone in Portugal to help grab the unmanned boat when it nears the shore. Another concept in the making, Solaris is a $33 million luxury super yacht that generates its own clean energy from multiple renewable sources. The 144-foot-long boat features a huge rooftop solar array as well as several wind turbines. Electricity generated on the ship from solar and wind also power an electrolysis system that splits water molecules, creating hydrogen fuel. In the cabin below, five separate bedrooms house up to 10 guests, with additional lodging space for the yacht's crew. The yacht is expected to be built by 2020, and designer Duffy London aims to target eco-tourism hotspots around the world with this unique clean energy vessel. 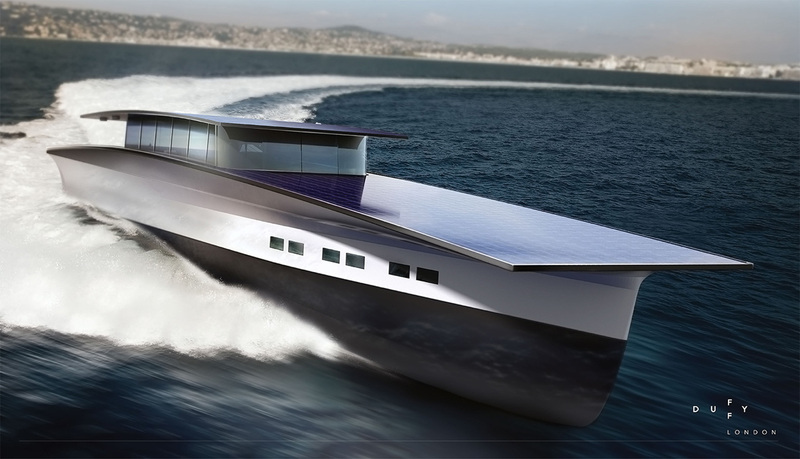 Dutch marine designers Soel Yachts created the concept for the SoelCat 12, a 39-foot catamaran built from lightweight, resilient materials and powered by electricity generated on-board from 809 solar panels. The pontoon-like day sailor is capable of cutting through the waves silently when operating via sun-generated electricity, and also features two 30kW battery-powered motors for a boost of speed when needed. Created for sightseeing adventures, SoelCat 12 employs special seawater-resistant materials for added durability, and Soel Yachts plans to manufacture the boat as a prefabricated flat-pack item, so that high-end tourism outlets around the world can easily order and assemble their own solar-powered cruiser. Another concept yet to be built, the Helios yacht has more in common with a sailboat than the other luxury cruisers we've featured, but it packs a solar-powered punch with the best of them. Rather than using sails made from canvas, Helios features flexible solar cell-clad sails made of silicon. 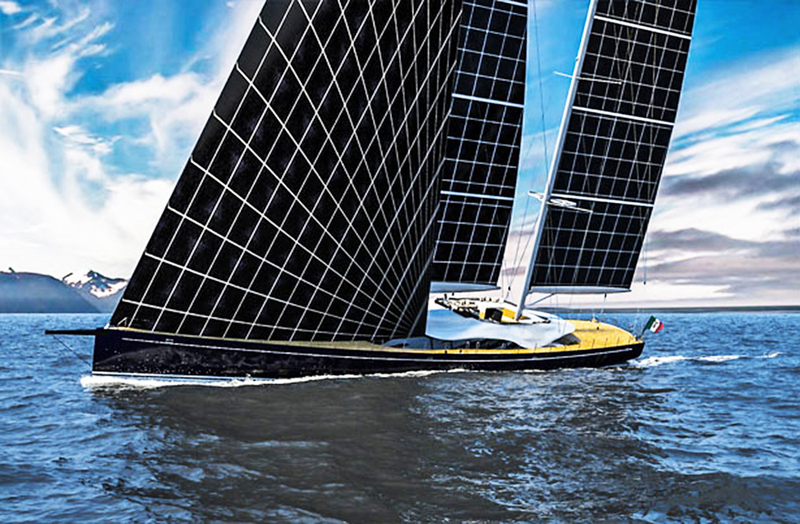 Some 2,500 solar panels would line the sails, generating 355 kWh of clean energy. Italian designers Marco Ferrari and Alberto Franchi envision the yacht as a 180.5-foot-long vessel capable of carrying eight crew members and 10 guests, who would never be bored thanks to the included sunbathing deck, infinity pool and movie theater.